Soothing bubbles + herbal beautiful scent = calm child. Our favorite flower is also nature's best skin soothing ingredient, Calendula. Calendula (kal' len' dula) is commonly known as the Pot Marigold and has been used to soothe skin for centuries. 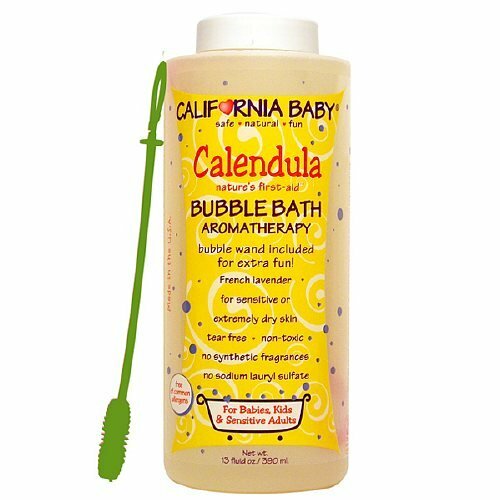 California Baby®'s Calendula Bubble Bath uses an active percentage of this wonderful flower. Try this soothing bubble bath to relieve dry, itchy skin. Our combination of mild, vegetable-derived bubbling agents, soapbark and yucca and our herbal complex helps to nourish and protect delicate skin. The product is no-tears and non-irritating and will not strip delicate mucous membranes, which can lead to yeast or bladder infections. No sulfates or DEA. California Baby®'s light & fresh CalmingTM essential oil blend combines beautifully with the herbal scent of calendula and makes a relaxing bathing experience.